It is no secret that I am obsessed with arrows. I have them on every gallery wall in my home, and if you follow me on Instagram you have seen me make these DIY wood arrows a zillion times. I never did a picture tutorial for them because I felt like it was easier to show you in video format. However, making a video takes more time and effort and it took me forever to get around to it. But today is the day. 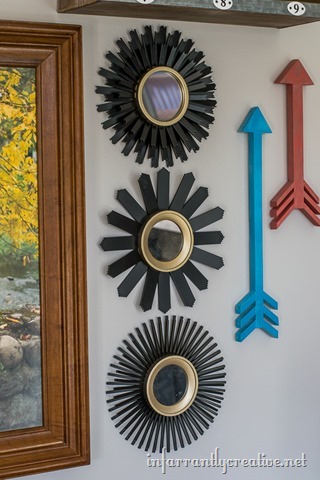 These DIY wood Scrap arrows are so easy to make – if you aren’t afraid of power tools. Yes I am afraid a table saw and a miter saw are mandatory for this project. You can do this! 1. For the arrows in the video I used some scrap 1×2 for the arrow’s fletching (I totally googled that word 😉 and a 1×4 for the tip. On my table saw, I ripped some scrap wood into 1/2” in width for the middle part. Make sure you wear eye and ear protection when using power towels. 2. I cut the arrow head and the fletching at a 35 degree angle. If you take a scrap of wood cut at a 35 degree angle and clamp it to your saw you can make the same cut over and over again making the same width of fletching each time. 3. Then cut your shaft (aka the middle part) the desired length at a zero degree angle. 4. With a sanding sponge, sand all rough edges. 5. Using nothing but wood glue press each of your pieces in place. They will be delicate since you aren’t use any nails or screws to hold it in place. However, I have found since they hang on a wall and are not being handled wood glue is good enough. 6. Let it dry for a couple of hours and then paint them with a wide thin paint brush. I find using chalk paint gives great coverage. Plus I love layering colors and chalk paint works the best for that type of layering. Sand the edges if desired. 7. The best way to hang them on the wall is to use 3M Command Strips (<—I big puffy heart those).